We’ve had so many requests for a pamphlet about friends and friendship, and finally it’s here! This insightful selection of ten funny, poignant and refreshingly honest poems deals with the reality of friendship in all its forms. 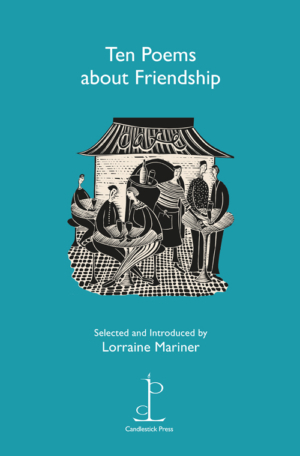 From childhood alliances at school through the angst of teenage years into companionship and the redemption of old age, Lorraine Mariner shows that friendship poems come in as many different shapes and sizes as our friends themselves. Poems by Edwin Brock, Polly Clark, Elizabeth Jennings, Jackie Kay, Lorraine Mariner, Alden Nowlan, May Sarton, Stevie Smith, Derek Walcott and Emily Wills.